The Golden Master release of iOS 6 is available to developers today. Only four betas have been released prior to now. With iOS 6 GM, iOS developers can prepare their apps to support the iPhone 5's upgraded hardware and larger screen. 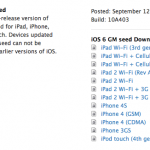 While GM version of iOS 6 (Build 10A403) is available for developers today, the public won't see an official release until Sept. 19. If you're a registered iOS developer, you can head over to Apple's developer portal and download it now.